Readers of Prospect Journal’s Week of Photo Journals last week may have noticed a striking example of defensive eyespots in one of the photos in the Central America article. These visual patterns are a particular type of mimicry that can be found in many species of butterflies and caterpillars, and a diverse array of other kinds of animals. They can be a handy disguise, allowing an animal to appear bigger or more dangerous than they really are, or letting a predator blend in with its prey. Sometimes the level of detail achieved in eyespots is astounding. Particularly convincing eyespots, like the pair in the cover photo, can have extra levels of details – notice how each eyespot has a small white pattern within it, which mimics light shining off of a cornea, making it look even more like a genuine eye. How and why might such a trait evolve? And why might they resemble eyes in the first place? In order for a trait to be selected, it must be hereditary (able to be passed on to offspring), and it must confer some competitive benefit to the individual. In general, that benefit could be the ability to more easily find a mate, or have greater numbers of offspring, or find food or other resources more easily. In this particular case, eyespots often promote easier survival by repelling predators, which we will discuss in more detail later. For a trait like this to develop in the first place, there must have been some variable patterns of pigmentation to begin with. Random pattern variations are fairly common throughout nature, but why do these patterns look like eyes? Spots, speckles, rosettes, and other circular shapes are generally pretty common throughout the animal kingdom. Think about cheetahs, leopards, many kinds of fish, salamanders, seals, hyenas, deer, etc. Spotted patterns crop up all over the place, and while they don’t typically resemble eyes all that closely, it is possible to see how they might evolve gradually from generic spot to eyespot. Let’s consider a few different species of caterpillar to illustrate different calibers of eye-mimicry in naturally occurring spots. 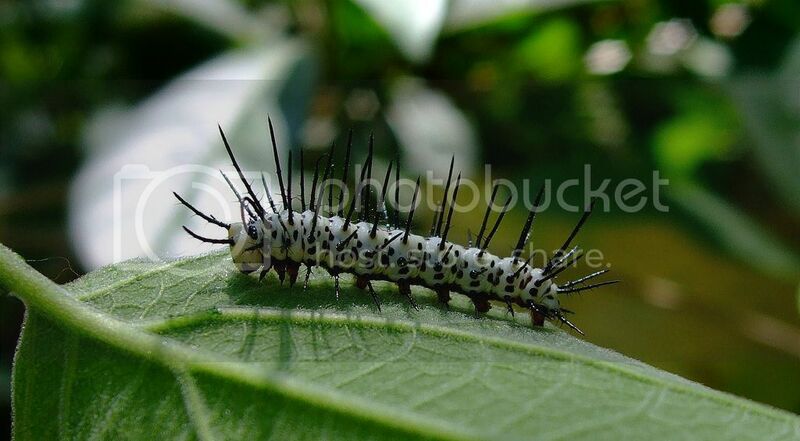 Pictured here is the caterpillar of the zebra longwing butterfly (Heliconius charithonia). As you can see by its numerous spines, it has gone for an entirely different type of defensive strategy, but underneath that prickly shield is a smattering of spots that don’t look like eyes much at all. However, spots similar to these must have been the original foundation, the starting point of many of the detailed eyespots that eventually evolved. 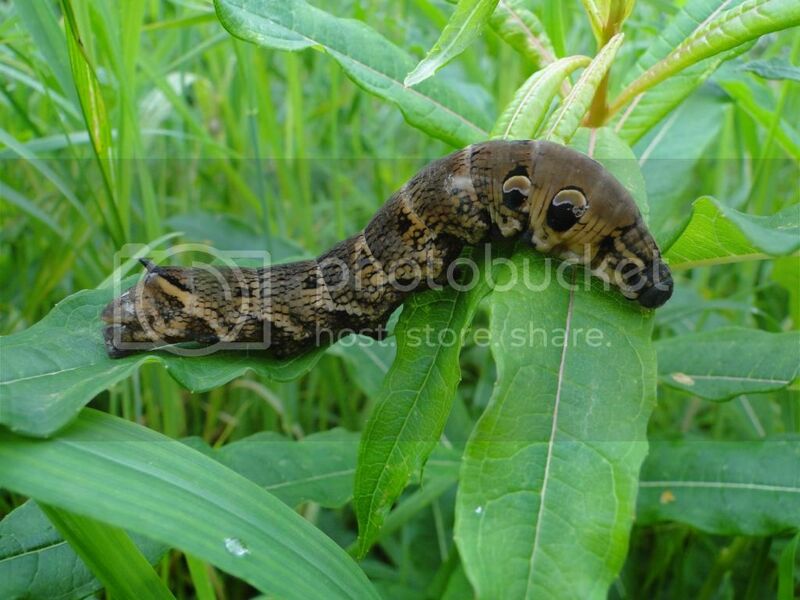 Pictured above is the caterpillar of the elephant hawk-moth (Deilephila elpenor). This is a pretty good example of a caterpillar with spots that are much closer to eyespots in size and position, but still rather unconvincing. The spots are certainly there, but they don’t really look very much like eyes, and they are probably less likely to scare off a predator. However, if genetic variation caused some of the individuals in the population to have spots that were even closer to the right shape, or size, or color or position to start resembling eyes, thus causing the whole animal to look more like a snake, then it would start to be effective at repelling predators. Like this guy, the caterpillar of the spicebush swallowtail butterfly (Papilio troilus). 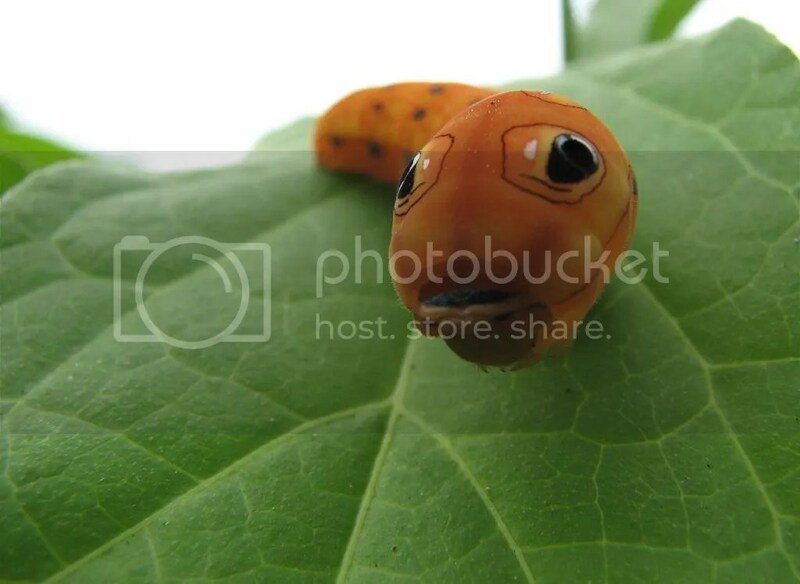 This species’ eyespots are very lifelike, and definitely give the impression that the caterpillar is both larger and more potentially dangerous than it actually is. The selective pressure acting on the eyespotted animal here relies less on how the individual utilizes the trait, and more on how the predator interacts with the potential prey. Typically, eyespots are exclusively visual traits. Although some kinds of butterflies and moths do flash them to momentarily surprise predators, it is unlikely that they know except by instinct that a predator might react to them the way they do. Nevertheless, the action of displaying eyespots has been shown to startle predators and give the would-be prey an opportunity to potentially escape. The notion of eyespots repelling predators has been theorized to be based on risk assessment on the part of the predator. Consider a scenario where you are walking along a trail and see something coiled up on the side of the path. It might be a snake, or it might be a pile of rope. You can’t see it well enough to tell what it is. If there is a small possibility that it is a snake and not a rope, it would generally be a bad idea to go and pick it up. Sure it might be a harmless rope, but it also *might* be a deadly snake, and you have a lot more to lose than to gain if that’s the case. It’s a similar phenomenon at work with eyespots. With the caterpillar example, if you are a predator, such as a mantis, and you are looking for a meal, when you see an eyespotted caterpillar, there is a chance that it is a harmless tasty caterpillar, but also a chance that it is a well-defended snake that might do you harm. Really the only way to determine what it is would be attempting to attack it, but if there are other prey options available, why on earth would you take that risk? With eyespotted butterflies, the disparity is even greater. If it is a butterfly, it would make a good meal, but if the eyespots are instead the face of a larger animal, you’d be walking or flying right into a trap. If the eyespots are flashed suddenly, the benefit of surprise would be conferred as well, forcing the predator to pause and process the new stimulus, allowing the butterfly an extra moment to escape. A predator would be smart not to take the risk at all, especially if there are other, more clearly vulnerable prey options out there. The risk avoidance behavior in predators discussed here is one of the selective forces that would allow eyespots that passively resembled eyes to become more common in the population. Individuals without eyespots would lack that defense and hence become more accessible prey options for predators, while individuals with eyespots would benefit from the risk avoidance behavior. By further random variation, and selective predation, the eyespots that are most effective would become more common over time. Since individuals without any protective eyespots are gradually weeded out of the population, some species have evolved to have eyespots as a universal characteristic. There are species of flies that utilize a similar strategy of disguise. 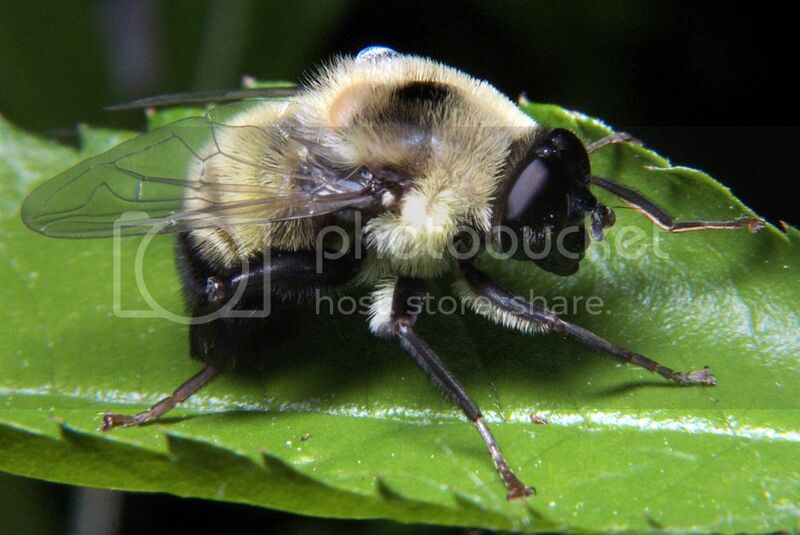 Many species of hoverfly in the family Syrphidae passively resemble bees for the same reason – why should a bird try to eat a fly that might be a stinging bee? It’s just not really worth the risk. Conversely, there are some species of spiders that mimic ants for the opposite reason; they want to look benign and blend in until the last possible moment when they reveal they are actually dangerous. More of a “wolf-in-sheep’s-clothing” example. Amazingly, the organism pictured below is a spider, not an ant. 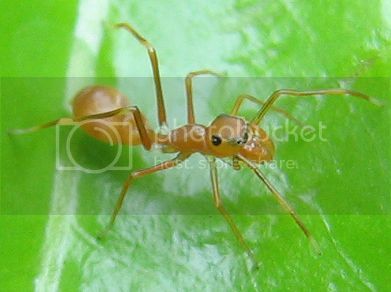 Another spider disguises itself abdomen-first as an ant, complete with abdominal eyespots, which are intended here to make it look harmless rather than dangerous. This species of crab spider’s resemblance to its weaver ant prey is pretty incredible. 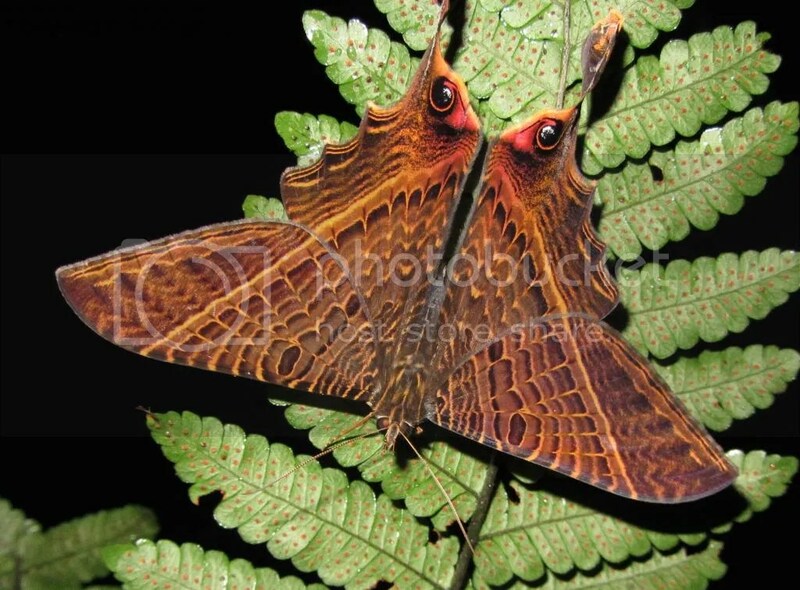 Among moths and butterflies, there are a few other examples of patterns besides eyes. Any pattern could theoretically work as a defense as long as it is perceived as scary by a predator. The main reason eye patterns are so commonly evolved is that circles are a comparatively common shape in nature. More complicated shapes are less likely to appear in random variation, but they still can happen. As is the case with this recently-discovered moth, whose wing patterns strongly resemble a spider, complete with hairy body and eight spindly legs. Authors of additional images linked here, in order of appearance: First caterpillar by DeadEyeArrow; Second caterpillar by Richerman; Third caterpillar by Michael Hodge; Bee-mimicking fly by Bruce Marlin; First spider by Sean Hoyland; Link to photo gallery by Alexander Wild.